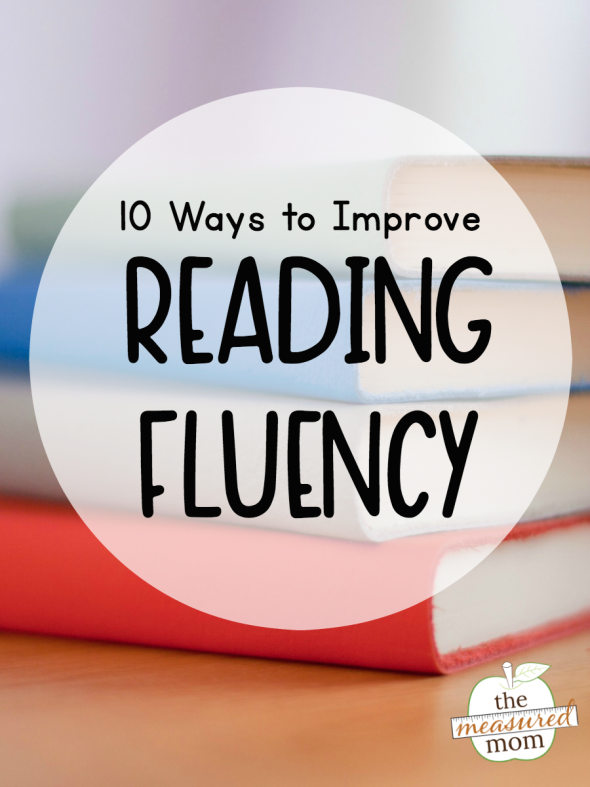 Today we’re sharing ten ways to improve reading fluency! We talk a lot about the importance of phonics. We’re always on the hunt for sight word activities. And we know that comprehension deserves major attention. Reading fluency is an essential element of reading instruction in K-2. Today we’ll talk about ten ways to improve it. Reading fluency is the ability to read with speed, accuracy, and proper expression. Do you know a reader who struggles with fluency? He. reads. every. word. like. this. Or maybe you know a reader who trips over words. To her, reading is awkward and painful. I personally know a reader (right in my own house) who reads automatically and with little stumbling. But he readslikethiswithoutabreath. I have to remind him to read with expression, to pay attention to punctuation, and to read with inflection in his voice. Whether our learners read haltingly, stumble over words, or read without expression, comprehension suffers. Better fluency leads to greater understanding. 1. Read aloud to children to provide a model of fluent reading. A regular read aloud period is a must in any elementary classroom. No matter their age or ability, children need a frequent model of fluent reading. Not sure what to read? My go-to resource for book lists is What Do We Do All Day. 2. Have children listen and follow along with audio recordings. A large listening library is ideal. 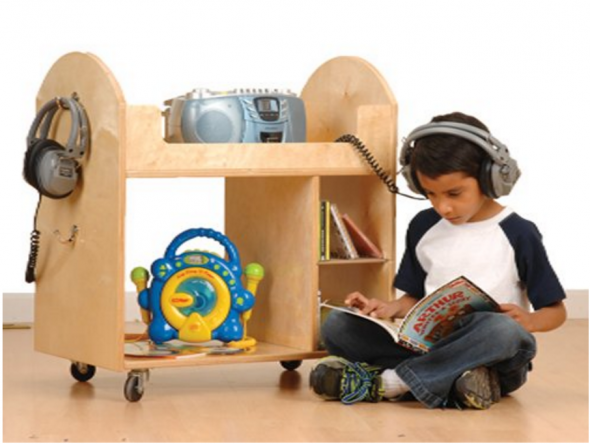 If your school’s budget doesn’t allow it, borrow audio books from the library and place them in your listening center. Some teachers even record themselves as they read aloud to their class – then they place the recording in the listening center. 3. 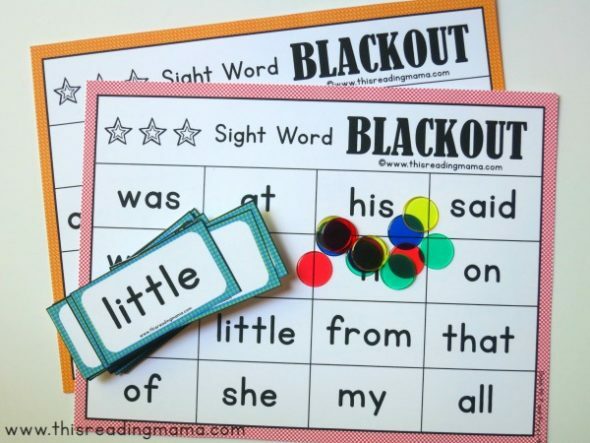 Practice sight words using playful activities. When children know many words by sight, they’re less likely to be awkward, choppy readers. I prefer games over flash cards. Thankfully, This Reading Mama and I have many ideas and printables to help you out! 4. Let children perform a reader’s theater. Reader’s theater requires no set or costumes and is a fantastic way to improve fluency. Children take turns reading their parts from a script and bring the text alive through their voices. To create a script, create an original play with speaking parts or adapt a familiar story by typing it up into several speaking parts. Looking for free done-for-you scripts? Get them here! Some teachers have made paired reading (also called “buddy reading”) a daily practice within their literacy block. To do paired reading, put students in pairs and have them read to each other. Pair more fluent readers with less fluent readers, but be careful not to make the ability gap too great. Children can take turns reading by sentence, paragraph, or page. In a one-on-one situation, the adult and child can take turns reading. With echo reading, the teacher displays an enlarged text so that students can follow along. This might be a Big Book or a text displayed on an interactive white board. The teachers often points to words as she reads a sentence or short paragraph. 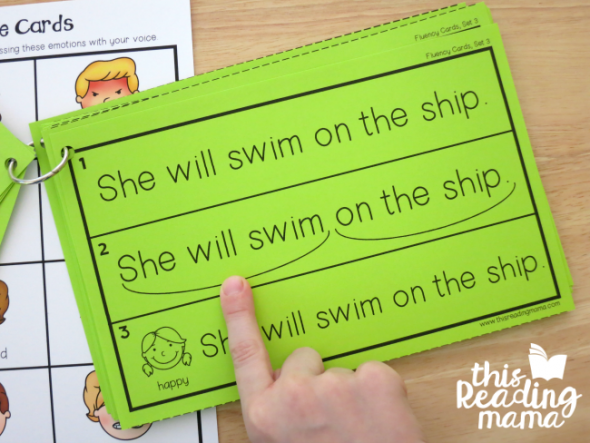 Then she points to the words again as students echo her reading. When I was in graduate school I tutored a (very) tall sixteen-year-old who was reading at a second grade level. In his spare time he would much rather listen to rap than open a book. With choral reading the teacher reads an enlarged text several times until students are familiar with it. Then the class joins her as they read the text together. Nursery rhymes, songs, and funny poems are fantastic for choral reading. Echo reading and choral reading are both forms of repeated reading. Repeated reading is also something that students can do individually. Choose a short passage of 100-200 words. Students can read the same passage multiple times. Have them time their reading and graph their results to see a visual record of improvement. A variation is to set a timer for 1-2 minutes and have students record how many words they read during each reading. Again, use a graph to chart progress. While we encourage beginning readers to point to each word as they read, this is something we want our readers to grow out of. Enter scooping phrases! Simply write a short passage on paper. Then guide your learner as he reads the passage and draws curved lines under each phrase. I highly recommend This Reading Mama’s done-for-you pack! 10. Have your students do a lot of reading – at a level they can read independently. The more we practice, the better at something we get. Make sure your readers are reading at their independent reading level, and give them at least 20 minutes each school day to read on their own. I, too, have a 16 year old with a second grade reading level. Can you tell us a little more about how to help an older student who is still not fluent? Sorry for the delay in answering your quesiton, Phyllis! I think that many of these activities are a great fit for older, struggling readers. But my favorite is to take turns reading funny poetry. I recommend trying the procedure in this post. Then click on the links at the bottom to learn more from my colleague at This Reading Mama. My son is 4.5 he reads ur sight word book series almost reached till set 9 . In a week should I introduce 1 sight word or can go for two if his grasping power is good enough ? Other than that wat else can I start cvc words or word family games as posted in ur blog , actually I ve started using it and he is combining pretty well but is this age okay to introduce 3 letter words ? Hi Rushina! You can definitely introduce more than one word a week if your son is ready for it. Just today I sat down with my five year old and worked at 3 words at one time. Also, if your child is ready to sound out words (see this post: https://www.themeasuredmom.com/reading-skills-kids-need-theyre-ready-sound-out-words/) 4.5 is not too young to start. I have a 2nd grader that is having trouble reading she is going to the 3rd grade but still reads on a 1st grade level. I don’t want her to repeat the 2nd grade what can I do to help her. She is eager to learn but she tunes out when she gets frustrated and I am not sure how to help her. Hi Jackie! I would ask her teacher specifically what skills to work on. Then you can send me an email and I can help you know what to do next. My email address is anna(at)themeasuredmom(dot)com. Hi there! I’m having the same issues as Anna with my 2nd grade son. He has no natural flow nor expression unless he is going very slow. When he picks up speed, he can read between 80 to 90 wpm but often stumbles with his words. Almost always he has to read 2 more times what he just read to understand what he just said aloud. We read everyday and I time him athome 5 times a week but improvement is lacking. Any suggestions would be great! Hi Stacy! A couple suggestions – can you find a way to make his reading be for an audience? My second grader had to practice reading a book aloud to his class, and we worked on that for quite a few days. It really helped. Maybe a cousin, neighbor, parent, or grandparent? Another idea is to record him reading a paragraph (using a smartphone or something else). Afterward, have him listen to it. He can rate himself on his expression. Then have him read it again and rate his expression a second time. Is it better? I think he really has to HEAR what he’s doing wrong in order to fix it, and to have a real REASON to improve. I homeschool my 7-year-old 1st grader. I just did a running record with her and timed her reading. This was a leveled reading passage that had no new code. She read 189 words, with 90% accuracy but she read it at 13 wpm. Is there anything above and beyond the suggestions above to help her? I read aloud a lot, and she listens to stories but does not really follow along as the readers go to fast for her to follow. This was an on level (middle of 1st grade) reading passage from our reading curriculum. Most of her errors (almost all) were code related, calling “wings” instead of “swings” for example. It is hard to get her to read more for practice as reading is so slow for her, therefore not fun. I was surprised that her comprehension was still acceptable (77%) at such a slow and painful rate. I will try to do a record on an easier passage to see if her fluency and accuracy is any higher. Should I focus more of her reading lessons on a lower level (independent level) reading texts? Hi Anna! There may be something official like that, but I’m not familiar with it. Hi. I have a 3rd grader who is struggling with fluency. His comprehension and phonics are at or above grade level- but fluency is low. We have done site words in the past and he can get them after about a week- but then will forget them 3 months later. Do you have any ideas.